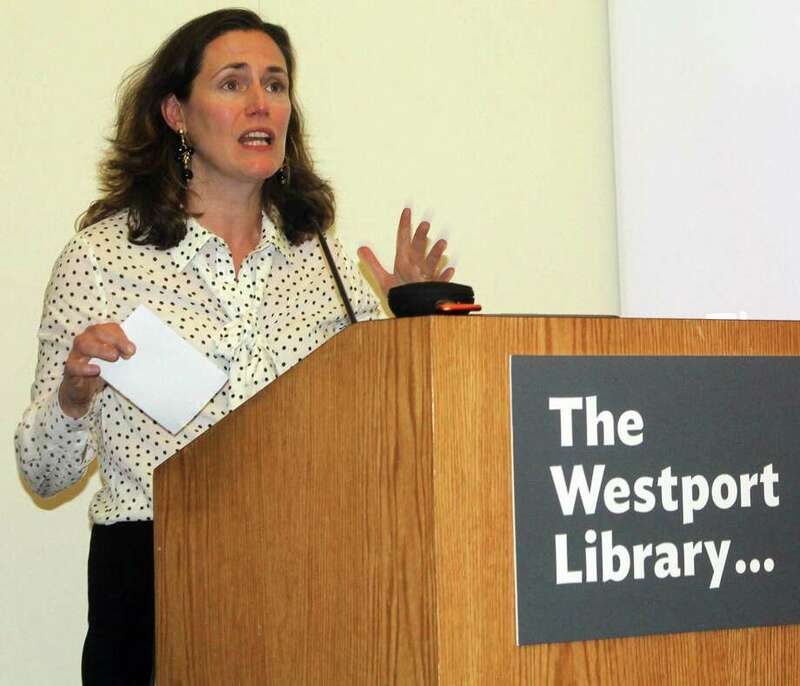 Democratic Women of Westport Co-Chairwoman Rebecca Martin introduced political media consultant Will Robinson for his talk at the Westport Library on April 30. WESTPORT — From her soft-spoken demeanor, it may not be immediately apparent that Becky Martin is a force in local Democratic politics. “It’s taken me out of my comfort zone somewhat,” Martin, 46, said of her work as vice chairwoman of the Westport Democratic Town Committee. Ellen Lautenberg is the group’s chair. Despite the discomfort of recruiting residents to be involved in politics, Martin, who also serves as co-chair woman of the Democratic Women of Westport along with Jenifer Gorin, said it’s her passion. “Definitely my on the ground Westport interest is mobilizing,” Martin said. Martin has helped execute forums on voter suppression, gun violence and “Raising Children in Trump’s America” in town. In the lead-up to the November elections, Martin organized a Democratic fundraiser, consulted local candidates on messaging, and drafted volunteers to participate in campaign activities that resulted in record turnout among Democrats. “It’s been a good intellectual life as well as an activist life,” Martin said of her leadership in town Democratic politics, adding she approaches the work from a desire to find common ground and then activate volunteers around those issues. “A lot of people are hesitant to be political locally, and I am too. There are plenty of Republicans I like in town, and we have to all live together, but we can identify shared values. I think we should all be able to agree that our children should not be shot going to school. It’s not just Democratic groups that feel that way about things,” Martin said. Last year, Martin testified in front of the state Legislature in favor of a ban on bump stocks and ghost guns with several other Westporters from the Democratic women group. If Martin sounds like a seasoned campaign pro, it’s because she. While a student at Bryn Mawr College, Martin got her start as a summer intern for the Democratic Congressional Campaign Committee in Washington, D.C.. “It was 1992, which was the last time we talked about ‘The Year of the Woman,’ ”Martin said. After the summer, Martin returned to campus and volunteered with Bryn Mawr’s college Democrats group to register voters and advocated for Marjorie Margolies-Mezvinksy, a Democrat who was running for Congress in the suburban Philadelphia district that included the school. The group registered about 100 people on campus, Martin said, which may not seem like a lot, but in the 1992 elections Margolies-Mezvinksy won by a mere 1,373 votes, and Martin’s contribution made a difference. “I had the taste of impact and just had the bug from there. All I wanted to do was graduate and work on a campaign,” Martin said. In the years after school, Martin worked as an organizer and fundraiser on Democratic political campaigns in North Carolina, Iowa and New Jersey, before leaving for law school at Georgetown University. “I practiced law for 16 months, but it just wasn’t as meaningful or satisfying or really interesting, especially the law practice I was in,” which was a regulatory practice, Martin said. Instead, Martin walked away from her law practice and took a job as a fundraiser for Tom Harkin’s 2002 senatorial campaign in Iowa. From there, Martin worked for United Nations Foundation to find private funders for U.N. Projects. In 2005, Martin and her husband, John Donoghue, who she had met while in law school, moved to Westport because Donoghue grew up in Fairfield and got a job in the area. Martin had visited the town while in college with her aunt and uncle, who lived in Darien, and remembered Westport to be lively. “I grew up in in Southern California, which had all these wonderful advantages, but this clearly was a town with a civic life, and a center, and a beating heart, and it looks like a New England postcard,” Martin said. At first, Martin worked in fundraising at the Yale Law School but stopped because she didn’t find the work as compelling. She has been a full-time mom and volunteer ever since, including as a representative on the Westport Parent Teacher Association Special Education Committee and, of course, with town Democratic organizations. Martin said she has worked even harder at her political advocacy since the 2016 election, but eschews the notion the current political moment is unique and insurmountable. “There has been progress and there have been worse times that we have worked ourselves out of,” Martin said. Amid her political work, Martin said she has a separate passion for writing. “It was the thing I always wanted to do but never had the courage to do,” she said. When she first moved to Westport and her husband worked long hours in New York City, Martin said she signed up for a continuing education writing class taught by Jessica Bram. At the time, “mommy blogs” and pieces about motherhood and children were booming, and Martin jumped on the train. She has since written personal essays for the New York Times Motherlode blog, ParentCo., and BrainChild, among other outlets. Now, Martin is hoping to establish herself as a a fiction author. “That’s still what I want to be when I grew up,” Martin said.